Terms & conditions are a necessary part of a Campaign or contest, but they tend to not be the most interesting part for both the marketer and the participant. However, terms and conditions serve two purposes: to protect your brand by being clear about the legality of the Campaign and what you’re going to do with the data collected, and to inform your participant about what the expectations are and how they can comply when they enter. This is why having a dedicated terms and conditions page hosted in a prominent place is so important. Traditionally, brands would host terms and conditions on their respective websites, and post a link to them on the main Campaign, whether that Campaign was print or digital. While this is still an option, especially if you’ve embedded your Campaign on your website, it’s helpful to create a landing page or tab specifically to host your terms and conditions. You don’t have to rewrite your terms and conditions for each new Campaign. Although each Campaign may have some specific details or dates, the template can remain the same for each Campaign, and it’s quick and simple to update. Any Campaign created with ShortStack is mobile-responsive, so you don’t need to worry about ensuring that the rules are formatted for mobile devices. You can customize the appearance of your terms and conditions to keep your branding consistent. Hosting the rules elsewhere, but keeping them accessible, prevents the need to have a big chunk of text on the front end of your Campaign. The first step is to write your terms and conditions. We know this process can be intimidating, so here’s a template to help you out. (Keep in mind that contest and promotion rules vary across state and countries.) To ensure that the necessary elements are included, follow our best practices for writing contest rules. Add your terms and conditions to a Rich Text Widget within ShortStack’s Campaign Builder. You can customize the rest of this Campaign by adding graphics or a link to the contest. Once the Campaign is formatted to your liking, you can publish it as a landing page or tab (or embed it). Using the Links Widget, which will create a hyperlink or button on your Campaign, add the URL for this page to your primary Campaign. 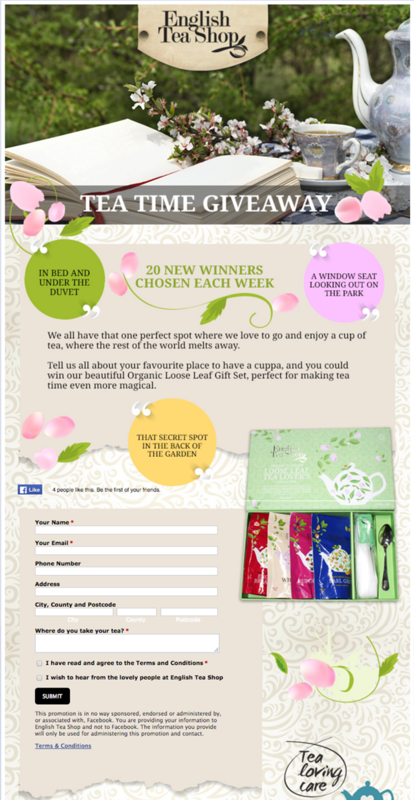 English Tea Shop’s primary Campaign is a giveaway, and toward the bottom of their form is a link to their terms and conditions. These contain information about the start and end date of the contest, as well as eligibility requirements and the rights to the submitted information. Clicking on the link opens the rules in a separate tab. Their terms and conditions are displayed using the same design elements of their Campaign, such as the header and background image, which keeps it linked to the main contest. They’ve also included a “Back to Competition” button to make it easy for participants to return to the main Campaign. The rules are clearly numbered and are formatted to make it easy for the participant to read. Once they return to the Campaign, they can access the terms and conditions again at any time by clicking on the link on the contest.